Description: VIA 687 - VIA F40PH-2 6427 heads north with 5 LRC's. Description: After it's stop at Brampton Station at 11:15, VIA #85 gets under way over the CN/OBRY diamond with VIA 6427 leading two HEP2 cars. Description: Though you can't see him, it is in fact 6427 pushing on the rear of 73. Some fresh snow and a 70mph VIA sures makes photography interesting. 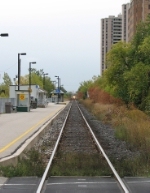 Title: VIA 6427 at Mile 260 Kingston Sub. Description: VIA 6427 with two different colours of yellow on the nose. 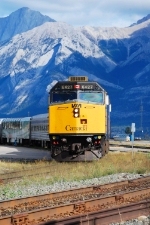 Description: This is the Via #5 starting of Jasper Via Station to Prince Rupert on British Columbia, Canada. This travel is probably one of the best trip to do when you have a little money! Description: Cross country VIA passenger train approaches St. John's Sideroad enroute to Toronto Union Station. Description: VIA 85 with 6427 arrives at Sarnia 15 minutes early, about 40 people got off the train. Title: VIA 85 at Mile 5.8 Strathroy Sub.